In our digital age, the printed book is often seen as resisting the immateriality and inauthenticity of the digital text through its “aura,” “singularity,” “authenticity,” “materiality,” and “bookness”––to cite some key terms from a conference on the future of the book that I attended last year. Even book versions that sit alongside versions in other media––what Marjorie Perloff terms “differential texts”––seem to stress the differences between the book and digital media and so each medium’s materiality. Yet in a range of poetic practices developed in response to the age of mechanical reproduction and to our digital age, the book becomes a site for exploring––rather than resisting––reproduction and iteration. In the final posts in my “Iterations” commentary, I want to focus on the dual role of the book as both material object and copy, beginning with the work of modernists such as Walter Benjamin and Gertrude Stein before turning to some recent iterative texts that challenge the commonplace contrast between the singularity of the print and paper book object and the repeatability and mutability of the digital text. The rise of new technologies of mechanical reproduction in the modernist period heightened attention to the book as copy, both in terms of the aura and materiality of the individual copy and as a reproduced non-original object. 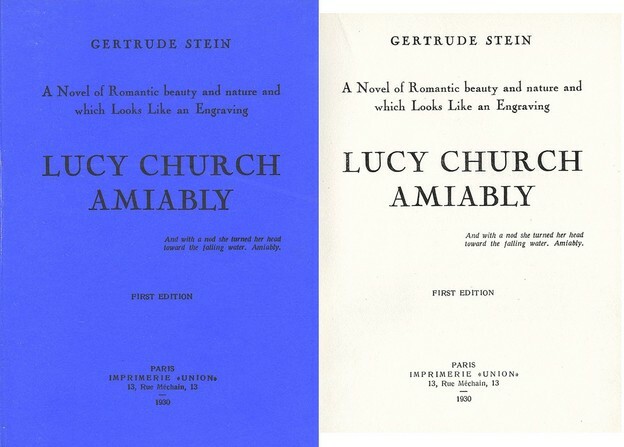 Gertrude Stein played with these two possible ways of looking at the book through her own press, the Plain Edition, which she used to publish a number of her works in the 1930s. Is poetry going extinct, or isn't it? Let's get this right, folks. 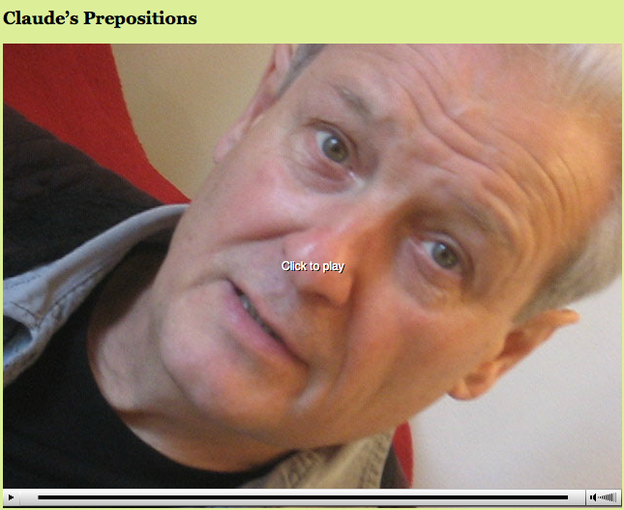 The Boston Review, on its site today, posts the 10 “best and most read” pieces of the year 2012. 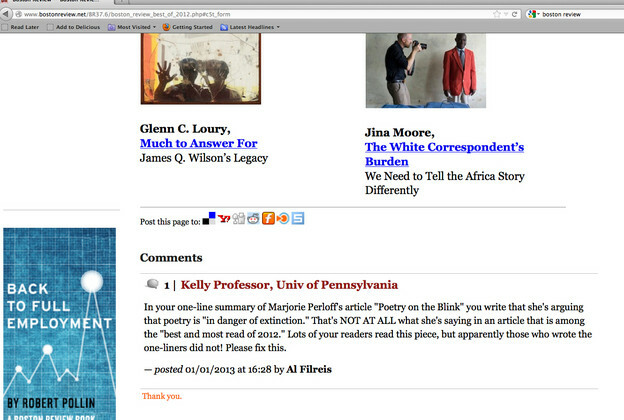 Among them is Marjorie Perloff’s “Poetry on the Brink.” But the one-line tag that goes along with the piece on their list says Perloff argues that poetry is “in danger of extinction.” That's not at all what she says. Oh well. So much for close reading. On November 10, 2012, there was a celebration at the Kelly Writers House in honor of Marjorie Perloff's induction into the American Philosophical Society. We timed the publication of a major Jacket2 feature on Perloff's life and work to coincide with the induction and the party. Here are a few photos taken that evening. Hank Eats the Shell ("The Shrimp is a poem in itself"
This feature celebrates the life and work of Marjorie Perloff at almost exactly the moment she receives the honor of induction into the American Philosophical Society, headquartered in Philadelphia, which happens to be — some blocks west of that venerable institution — home base for Jacket2. APS election is something like what in L.A., Perloff's own home, is called “a lifetime achievement award.” So it seemed time for us to bring together not just friends but also critical admirers at various distances to write brief retrospective reviews of her work over the years. 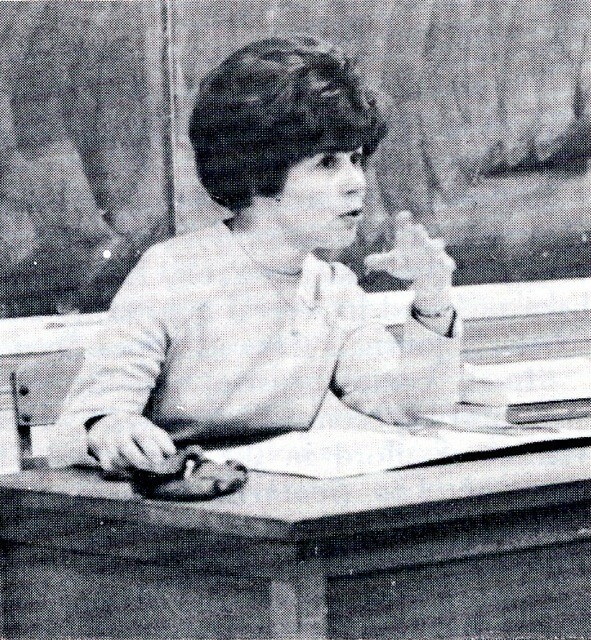 Perloff lecturing in 1965. Image courtesy of Marjorie Perloff. With her work now spanning over four decades of publication, the preeminent critic and scholar Marjorie Perloff has amassed a body of writing on avant-garde/experimental poetics, modernism, postmodernism, pedagogy, and a host of other topics that remains at once complex and accessible, insightful and provocative. 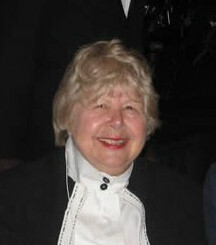 Marjorie Perloff at the ACLA Forum, 2007. Marjorie Perloff is one of our best readers of poetry, one of those critics whose interpretive craft is always compelling to follow. She has not only kept practical criticism relevant, she has shown that it can be renewed even in the close reading of the most refractory modernist poems. This commitment to close reading has required nerve. 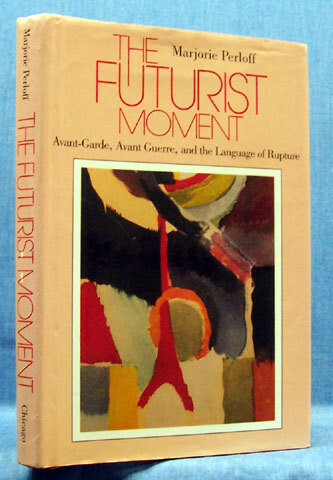 Even critics sympathetic to the modernist avant-garde can be opposed to such a critical strategy: close reading, they say, is mere pedagogy; it views the text through lenses tinted with undeclared ideological commitments; it finds in even a multitudinous text just a few devices and deconstructions; it is ahistorical; or it is too historical, too closely rooted in the historical moment of the reader. Despite such pressures to abandon close reading, Perloff has held fast. 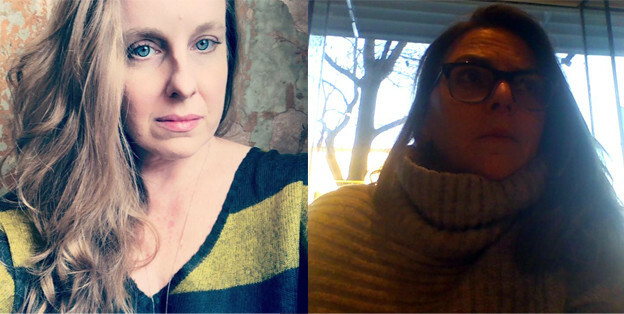 Close reading enables her to affirm the fundamental intelligibility of poems, and locate this intelligibility in the logical space of reasons, the embodied space of empathy, and in a long and many-sided poetic tradition. 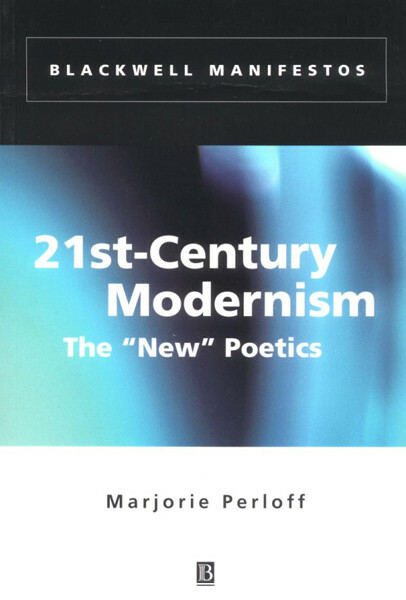 Published in 2002 as part of Blackwell’s “Manifestos” series, Marjorie Perloff’s 21st-Century Modernism is a passionate restatement of her commitment to avant-garde writing and its role in an increasingly mediatized future. At a moment when the notion of the postmodern seems “to have largely lost its momentum,” we need to appreciate, says Perloff, the full potential of modernism’s continuing legacy. 21st-Century Modernism accordingly revisits some old enthusiasms — Stein, Duchamp, Khlebnikov — and also returns to Eliot’s early work to discover there an avant-gardism Perloff now feels she undervalued in her previous books. This review of literary modernism neatly summarizes the qualities of avant-garde writing that Perloff will then rediscover in the “second wave of modernism” that she associates with the contemporary texts of Lyn Hejinian, Steve McCaffery, Charles Bernstein, and Susan Howe (5). 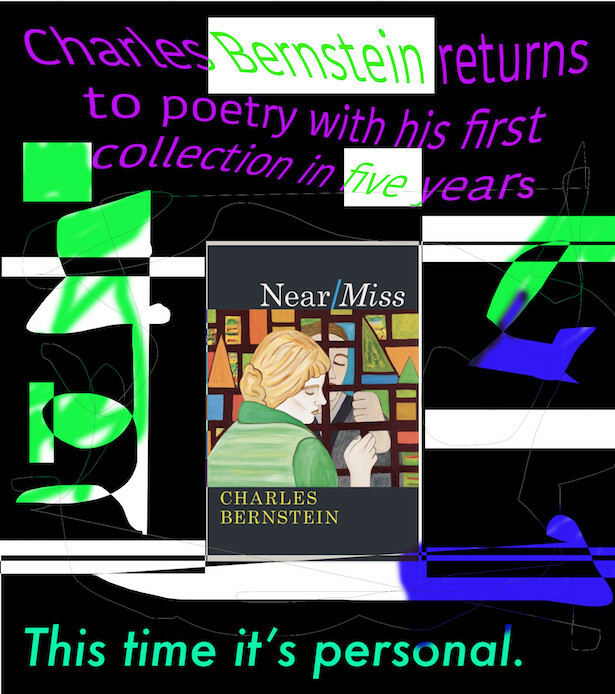 The features emphasized are by now familiar ones: the collage-text, the “indeterminacy” of meaning that underwrites a determined anti-subjectivism, the repudiation of mainstream “authenticity” or what Bernstein has nicely called “the natural look,” and, above all, the recognition of the text as “verbal artifact.” This latter term consistently governs Perloff’s approach to the avant-garde, compelling her readers to realize that when Williams, for example, declares “No ideas but in things” or Pound calls for “Direct treatment of the ‘thing’”, they are speaking not of material objects but of the poem as “thing,” as conception and as verbal construction (a distinction missed by subsequent generations of critics, but not, of course, by the modernists’ immediate successors: the Objectivists). 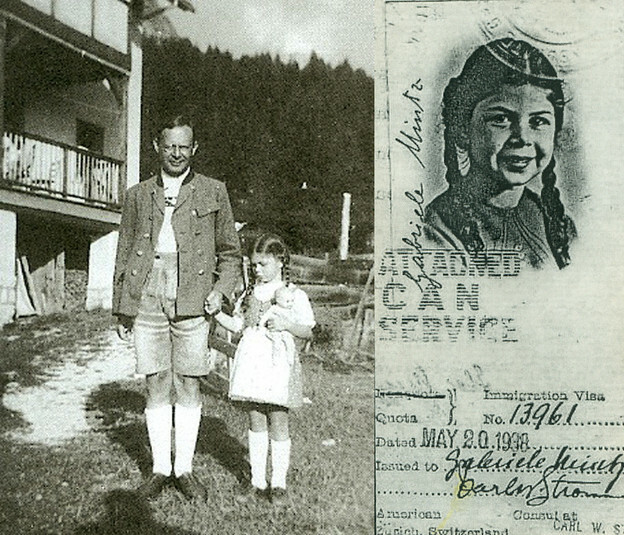 Gabriele Mintz and her father, Max; at right, Gabriele's passport photo. Courtesy of Marjorie Perloff. The argument of Unoriginal Genius is whole and sufficient. It hardly requires the assistance of — nor should its beloved author have to tolerate the prospect of reduction by — my quasi-psychoanalytic reading of the book’s stirring culmination in its chapter on exophonic writing. So attracted am I to the refugee’s story of discontinuity and yet nonalienation, and its possible effect on all subsequent forays into language, I can’t help myself. To be sure, the final section on Kenneth Goldsmith’s Traffic (chapter 7) is really theargument’sconclusion, but “Language in Migration” (chapter 6) is the capstone of its poetics, standing at the limit of its emotive (if I may) trajectory, Perloff’s strongest ever embrace, via Susan Howe and Caroline Bergvall, of a poetry she intensely admires for its exploration of “speaking patterns,” including “slips of the tongue or of the culture” (131; emphasis added). In her many talks, lectures, interviews, and reviews — through her willingness generally to speak freely on almost any topic — Marjorie Perloff has had a great deal to say about “slips … of the culture.” But here, in Unoriginal Genius, that interest, which accumulated through the years of culture wars in the late 1980s and early 1990s, and developed further through the 1990s and 2000s, has found its proper place within a poetics positioned against the “culturally pluralistic, yet divided, and markedly monolingual society” — a society that “harass[es]” and “discriminat[es]” against such mis-spokenness rather than appreciating and indeed celebrating, as I believe Perloff does, art that arises from the special trauma induced by the linguistic politics of such monoculture (131, 132).